Raz was invited by Bethan Emmett to present a one day workshop for 25 people. 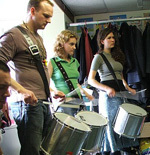 This mixed abilities group consisted of participants from local the Samba group, Samba Sol. My brief was to present a piece of music that combined elements from Cuban and Brazilian rhythms for the Bateria. I presented a piece for Ochun/Oxum, Yoruba Goddess of Sweet Water, and Obatala/Oxala God of Peace and wisdom). I mixed aspects of traditional Ijexa from Brazil and Iyesa from Cuba and also borrowed some rhythmical patterns and phrases from Cuban bata drumming which was played on the Surdos. 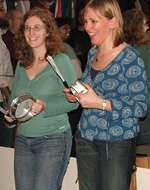 The music has several sections including; intro, bridge, two main grooves and a couple of breaks. The group worked hard and everyone was extremely attentive throughout the day. 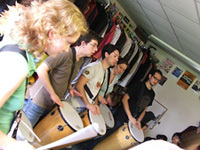 There was a good balance of instruments with 6 surdos, 3 repiniques and snares, 4 timbas, 5 agogos and 5 tamborims. The music was played with a good swing and the group held the tempo well. Some general guidance and tips for playing in a more relaxed way. Helped snare and repinique players with tips to improve stick control. As ever, Ravin’s teaching style was great and the piece we learnt worked really well with the band.